Concord held its second annual Medical Futures Conference last Saturday, aimed at supporting prospective medical and dental students throughout the West Midlands region. 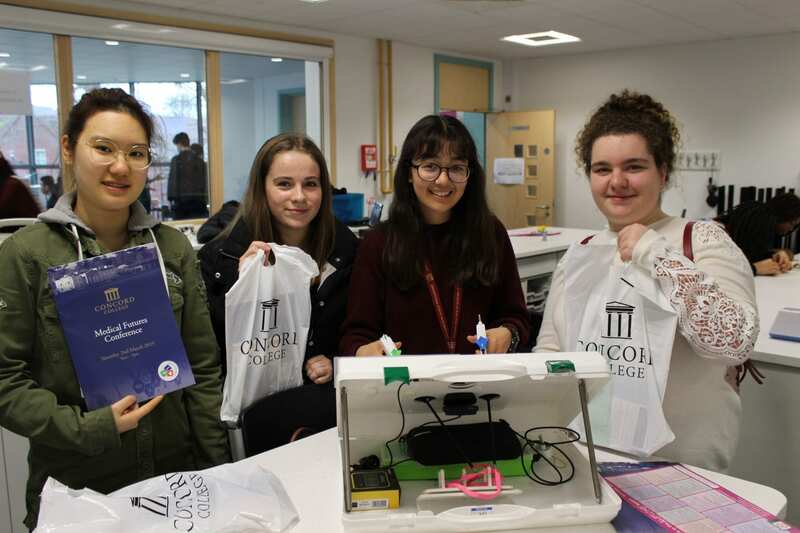 70 students from Years 10 to 12 across the region attended the day-long event that took place in Concord’s Theatre and state-of-the-art Science Block, in addition to 90 of Concord’s prospective medics. A number of parents also attended to learn more about the applications process and have since described the conference programme as “amazing”, “invaluable” and a “winning formula”. The Science Block entrance itself was a haven of inspiration, with the welcome addition of Concord’s new DNA spiral sculpture and wave motion pendulum providing a ‘wow factor’ to visiting students and parents. In “Meet the Universities”, students had access to top medical schools from over 20 universities across the UK and the chance to speak to admissions tutors and current medical students, many of whom were Concord Alumni. The day also consisted of insightful lectures and workshops, with a wide range of health care professionals supporting the event. Concord’s Head of Science, Mr Barry Brown said: “Ten consultants joined us for the day, many from the Shrewsbury & Telford Hospital NHS Trust, but also from further afield, including a junior doctor, a pharmacist from Severn Hospice and a dentist from New Park House in Shrewsbury. “I am so grateful to this wonderful group of people for helping to make the day so successful. Thanks to everyone involved in the planning and delivery of the day. “In fact, a huge number of the 160 pupils who attended the day thought “Meet the Professionals” was the best part of the day, with 72% rating this with top marks. “Thanks must also go to Medical Mavericks and The Medic Portal for giving their time freely to enrich the day with lectures and a fun, interactive clinical skills workshop.” Concord student, Alena from 6.1 who studies Biology and Chemistry said: “The event was very diverse in terms of lectures, courses and fields of medicine. “In particular, I found that the informal talks and workshops were all very inspiring. “After chatting to university representatives and medical professionals, for the first time, I felt that attending medical school is not impossible and we can all make it with the right attitude and approach.” The final highlight of the day was the keynote lecture, “The Making of a Woman Surgeon” by Gillian Cribb, from the Robert Jones and Agnes Hunt Orthopaedic Hospital. This provided a ‘sneak peek’ into the life of an orthopaedic surgeon, with external students describing it as “inspiring”, “honest, informative and funny.” View the 'Medical Futures Conference' photo gallery by clicking here.